September 2018 is the Meanwhile Film Series' 10 year anniversary month!! The Meanwhile Bar and Wealthy Theatre team up to present the Meanwhile film series! The weekly brew & view every Tuesday night! This week's film is The Room Directed by Tommy Wiseau, starring Tommy Wiseau & Greg Sestero. The film is rated R, with a runtime of 1hr 39m. The Room is a 2003 movie written, produced, and directed by Wiseau, who also stars as its main character, Johnny. It was originally envisioned as a stage play, then turned into a 500-page novel, and ultimately finalized as a movie script. Since its cult success, Wiseau has tried to pass his film off as a “black comedy” rather than an inept melodrama that’s unintentionally funny, but he’s not fooling anyone. (Vox.com). Come see it on the big screen with us Tuesday, September 11th! 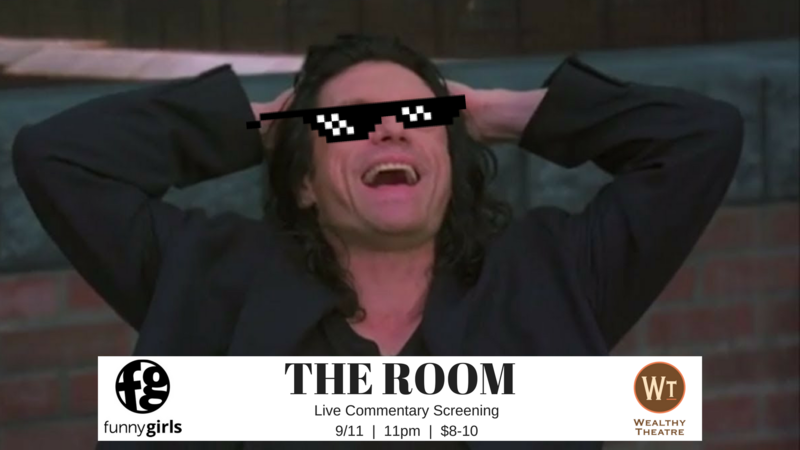 Funny Girls teams up with Wealthy Theatre for the 11pm showing of The Room, with a live commentary screening (ala Mystery Science Theatre). Themed cocktails will be available at the bar for CMC members. Recommended attire: Red dresses and ill-fitting tuxedos. Plastic spoons only. Please, no metal spoons, and no footballs.